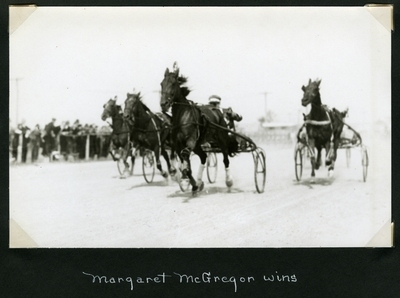 Black and white photograph of bay mare, Margaret McGregor wearing head number three, Snell up, winning the the first heat of the 2.14 Bar Trot at the Cumberland Harness Racing Track, West Cumberland, Maine, Saturday, September 23, 1939. Claiming the second place finish is bay mare, Fashion Hanover. Bay gelding, Kash Buster crossed the line in third place.